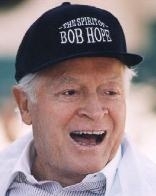 Bob Hope was Water Rat number 772. He was initiated at our Gray's Inn Road headquarters on 27th August 1991. Bob was proposed by Past King Rat Bernard Bresslaw and seconded by Past Musical Rat Pat Dodd. A sad time for us all to lose such a distinguished Water Rat and such a revered entertainer and human being. After his initiation we had a marvellous luncheon in his honour. The laughs flowed thick and fast and he and Dolores said it had been a brilliant day. Our condolences to Bob's family - he will be sadly missed by a world much in need of his spirit and ability to make us laugh.